On April 13 and 14, Google’s Mountain View campus suddenly had a much younger population. That’s because 875 high school students stopped by for Google’s fourth annual Tech Day. Over 150 Google and Alphabet volunteers joined the kids in 129 interactive STEM (science, technology, engineering and math) activities to empower them with knowledge and inspire them to get started in disciplines like computer science. But Tech Day isn’t just about fun and games. The event was designed for students who may not have regular access to technology classes at their schools. The students who attend Tech Day have very little experience in technology and computing, but they might leave the event inspired to pursue a new career path. Since then, Tech Day has expanded to a full weekend, with three times the students it had in 2016. And the list of activities has grown beyond just classes. Kids can now participate in games and breakout sessions that help them loosen up around technology. The event’s organizers say one of the biggest obstacles the kids face is not seeing all the career options they may have. “They might think they can’t work in any role in tech just because they struggle with math. This isn’t the case,” says Melaena Roberts, a software engineer and volunteer team lead. User experience designer Bingying Xia says she volunteers at Tech Day because she’d like to let students know that there’s more to tech than computer science. “The world also needs smart, creative designers to find user problems and come up with innovative design solutions,” she says. Organizers and volunteers really invest themselves during Tech Day to give students as much knowledge as they can, but they learn a lot from the students, too. Melaena says student feedback has informed how Tech Day has changed over the years. 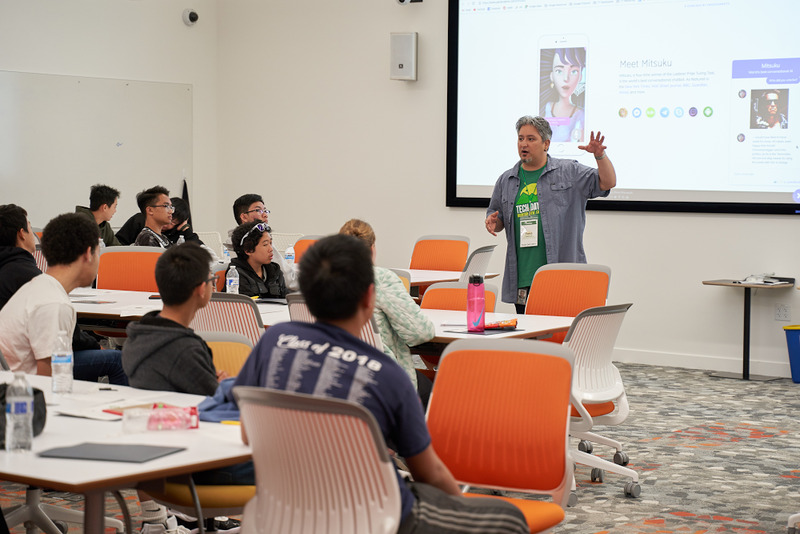 Volunteer Volker Grabe, a software engineer at Waymo, says he notices kids speak their minds more as the day goes on and they realize the day isn’t as tough or competitive as they expected.